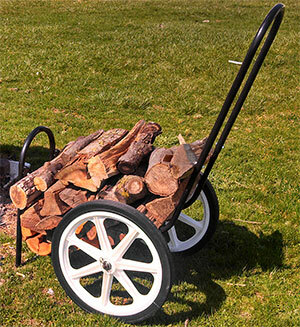 The Mid West LC-200 Log Caddy was designed to bring the firewood from woodpile to the house with ease. The LC-200 Log Caddy is safe and reduces the risks of falling on icy sidewalks with an armful of wood. Be prepared for winter storms! The Mid West Log Caddy will haul approximately 6 to 8 armfuls in one trip. You'll spend more time enjoying the warmth of the fire and less time trudging out for more wood. 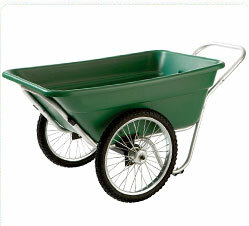 Designed with two heavy-duty 20" semi-pneumatic tires for easy maneuverability. You will be amazed at what the Mid West Log Caddy can do for you! The Log Carrier has the quality and workmanship you have come to expect from Mid West Carts. The merchandise you have purchased from us has been carefully engineered and manufactured under Mid West Products rigid quality standards and should give you satisfactory, dependable operation. However, like all mechanical merchandise, it may occasionally require adjustment or maintenance. Should you need technical assistance, please contact MID WEST PRODUCTS.